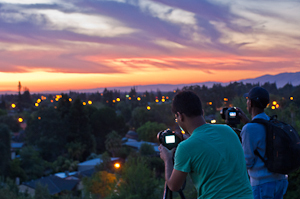 On a very warm Saturday evening in Campbell, California, ten photo enthusiasts met at the beautiful Aperture Academy gallery for an introduction to astrophotography. 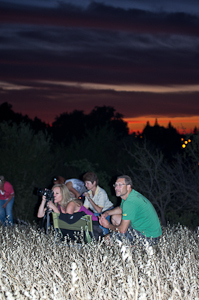 Our Dark Side workshop is geared toward teaching students the basics for shooting stars in the night sky using all manual settings and long exposures to best capture the mysterious, magical night sky. As is our tradition, instructors Ellie Stone and Jean Day began the evening with everyone introducing themselves in order to get a feel for their student's current skill levels and knowledge of their camera gear. 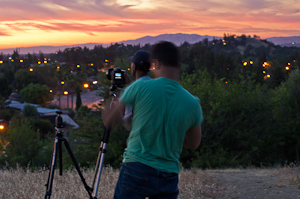 Students were able to express any ideas or methods each hoped to gain during the evening to help them achieve greater control of their cameras and final images, and take their photography skills to the next level. Ellie began the night's tutorial with a slideshow presentation showing the various methods used to capture the night sky. From static, or "pin point" stars, to the longer star "trails," students were given examples of how these final images were created, from using ambient or available light, to the techniques for using flashlights to "paint" foregrounds to show against the dark night sky. Following the presentation, it was time to head out to a real-world location. 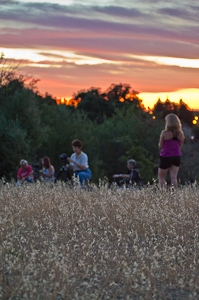 On this wonderfully warm evening, our destination was south of San Jose, at a local park set in the hills. 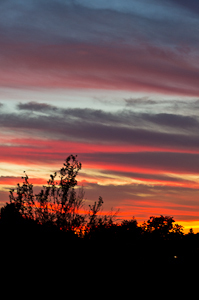 While driving to the park, the cloud-filled skies erupted with the most beautiful sunset colors, creating shades from bright yellow and orange to the deepest pinks and purples. 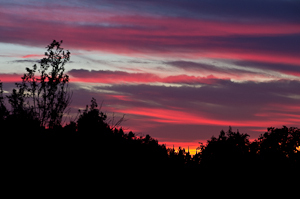 As landscape photographers, Ellie and Jean wanted their students to get a chance at that sky, and were very pleased that it lasted long enough to reach the park, so that the class was able to take advantage of the remaining few minutes of spectacular color. 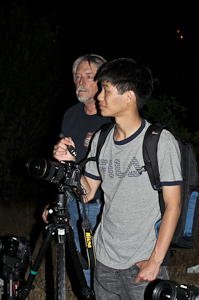 As light faded into the deep blues of this moonless night, students were instructed and assisted in manually focusing their lenses to achieve the depth of field needed for a tree-lined hillside with background of the stars above. Although ambient light from street lights in a nearby neighborhood helped to illuminate the foreground, flashlights were also used to paint the trees adding more detail and interest. 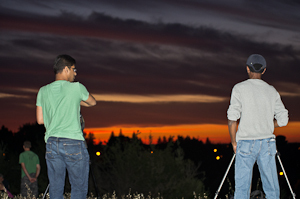 Students were shown how to make multiple images with shutter speeds of 30 seconds or less to capture pin point stars; they learned that longer exposures cause the stars to appear as small streaks, and were quickly able to get the tack sharp stars desired. After a fun night of cameras pointed toward a beautiful sky, and image cards filled, it was time for a group shot commemorating the evening before heading back to the gallery. Ellie set up her camera and... proceeded to blind everyone with the flash! 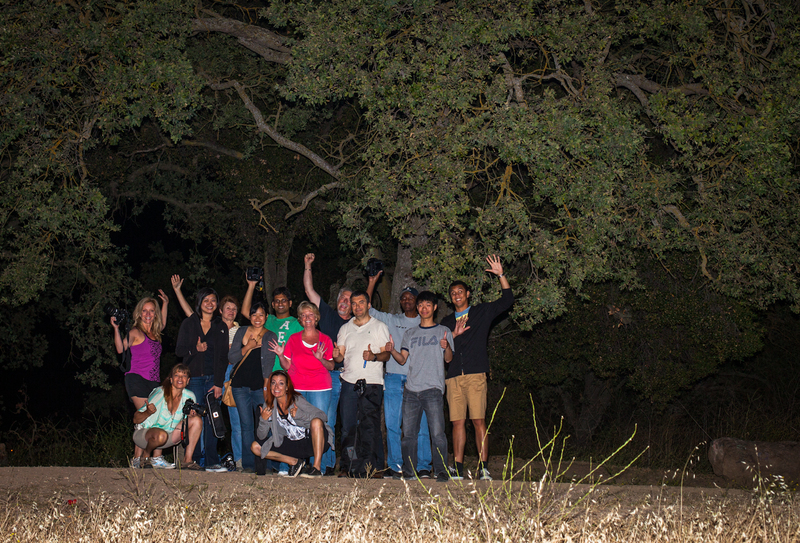 But it was a funny end to a great workshop with this fun and friendly group of photographic night shooters. From Ellie, Jean and the Aperture Academy staff, we hope you enjoyed your time with us learning new skills and creative ideas to use in furthering your art of photography!